Coconut has so many health benefits, with more being discovered every day, including fat loss, improved cognition, thyroid and digestive health. For most health applications, oil provides the highest concentration of healing. Coconut's unique fatty acids used to be on the "naughty" list because of saturated fat. Scientists now know though, that not all saturated fats are created equal. The Medium Chain Triglycerides in coconut are metabolized different from the long-chain fatty acids common in American diets. They head from the digestive tract to the liver, where they are converted into energy, either to be used right away, or as ketones, for later use. Ketones appear to play a role in reducing fat deposits, particularly those in the belly area. They also reduce appetite, and studies show that people consuming coconut oil at breakfast time, eat significantly less during the day. Some say a calorie is just a calorie, but the truth is that different foods invoke different metabolic and hormonal responses in the body. Coconut's medium-chain triglycerides cause a higher rate of energy expenditure (calorie burning) than equal amounts of longer chain fats do. One study concluded that 15-30 grams of MCTs in one day increased energy expenditure by 5 percent. That translates to about 120 extra calories burned in 24 hours. A ramped up metabolism often makes us feel more energetic as well, because metabolism speeds up all processes in the body, not just fat burning. Ketones have also been shown to mildly counteract brain fog and dementia and to help with neurological disorders such as Alzheimer's and epilepsy. Drug-resistant epilepsy in children has been especially receptive to high blood levels of ketones, which somehow minimize the number of seizures experienced. Research has intrigued the medical community, and is ongoing. Studies also show that Alzheimer's patients also seem to benefit from fatty acids in coconut. This may be because parts of the Alzheimer's brain can no longer metabolize glucose for energy, and the brain can use ketone bodies as a substitute. Half of coconut's fat comes in the form of Lauric Acid, with antibacterial, antiviral and antifungal properties, providing a good measure of protection against infections of all kinds. As our digestive enzymes work their magic, monolaurin is also created, which shares the infection-fighting properties of Lauric Acid. Coconut has been specifically implicated in treating dangerous staph infections and Candida. Hard to believe when we think about that dirty word, "saturated fat," but studies have shown coconut oil reduces triglycerides and LDL ("bad") cholesterol and increases HDL ("good") cholesterol, antioxidant blood levels, and blood coagulation factors. All these can help reduce heart disease risk. 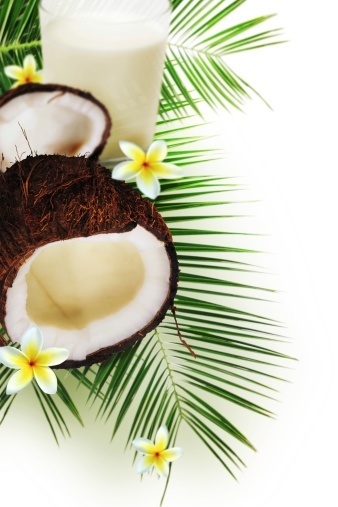 Coconut, in cream or oil form, can protect and repair dry, cracking skin and hair. Studies show that coconut applied directly increases lipid and moisture content. It also blocks out some of the sun's ultra violet rays. When researchers figured out that coconut water has a high level and proper balance of electrolytes, demand skyrocketed. Coconut water, especially if its unsweetened, provides a perfect balance of five electrolytes for optimum hydration. Last but not least, populations who eat a great deal of coconuts as part of their natural, life-long diets, have great longevity. The Tokelauans of South Pacific, for example, get 60 percent of calories from coconut, consuming much higher than average levels of saturated fat, yet have far lower rates of heart disease than Americans do. In a (coco)nut shell, what's not to love?